Every year my elementary school, like others across Canada, held a special assembly to commemorate Remembrance Day. The year I was in Grade 7, I was selected to read the poem In Flanders Fields, to the students, teachers and parents who attended. I remember telling the teacher that I could recite it by memory because of its familiarity over the years. However, it was decided that there was more gravitas to reading than reciting. It's a poem that has stayed with me through the years, and one that I recite to myself on Remembrance Day, to honour those who have fallen for the sake of freedom. 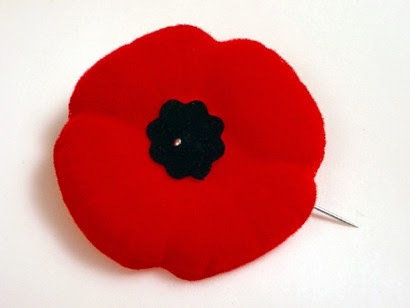 We in Canada wear poppies, provided by the Canadian Legion, as a sign of remembrance.